At this time, I bet that Sony Xperia Zr is the smartphone as a flagship for Sony manufacturer. The hardware and specs are installed with its best features the Xperia ZR can had. This including the design of the device that purposely acquires IP58 certified for dust and water proof / resistant along with shatter proof and scratch resistant glass on its 4.55-inch TFT HD capacitive touchscreen. Sony Xperia ZR C5503/C5502 (the same type but difference on data network frequently supported by the device) is also attached with 13.1 Megapixel Camera with HD 1080p@30fps ability to record video along with LED flash and HDR ability. The phone runs on Jelly Bean Android version 4.1 Operating system with quad-core 1.5GHz Krait CPU, Adreno 320 GPU, Qualcomm Snapdragon AP@8064 and also has 2GB RAM. Unfortunately the internal memory is only installed with 8GB for up to 5.6 user available. But don't worry, there is microSD slot for up to 32GB available on the device. 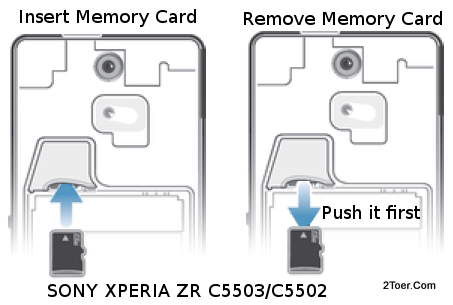 In order to be able to insert both of external microSD card and also micro SIM card on Sony Xperia ZR, you must remove the back cover of the phone first. The SIM uses card holder that you need to eject from card holder slot locates on the inside of the back cover, but for microSD card, you can directly inserted to its slot. There is a gap on the bottom side of the phone (rear panel facing up). It's located in the middle of the bottom side. That's the starting point for you to open the cover. Insert your thumbnail into this gap, then lift it up gently. Whenever the cover is half detach, continue to detach the sides until the cover fully removed from the body of Sony Xperia ZR. If you need to attach the cover back to the body of Xperia ZR, all you need to do just align the cover side with the body, make sure the camera hole align with the 13.1MP rear facing camera, then press the sides down until your hear click sound. Make sure the cover side is leaving no gap, when you notice any gap, press the cover down once more time until it click and the gap disappears. The location of SIM card holder slot and microSD memory slot are placed at the same location. It's just like two building floors, the ground floor for microSD slot, the above floor (1) for the micro SIM card holder slot. To insert the micro SIM Card to its slot, first you must pull out the card holder from the slot. You can use your fingernail to draw it out the card holder. Then with micro SIM gold-contact facing down, place the micro SIM to its card holder and make sure the cut-edge aligns properly with the card holder (right-out). Then push the card hold back to it slot until the holder reach the end of the slot. Inserting the microSD memory card should be easier than the way on inserting the microSIM card. You just need to make sure the gold-colored contacts of the memory card facing downward, thne aligns the card to the slot (under the SIM slot), the push it to the slot until the card locks. Removing the microSIM card from Xperia ZR is a simple and no problem way if you already knew how to insert the microSIM. Just do the same steps on pulling out the SIM card holder from its slot, then remove the microSIM from the holder. You can use the fingernail to make it easy on grabbing the SIM and removing it from the holder, and then push the holder back to its slot or you can change with other microSIM card. Go to Home screen ~> Tap Apps ~> Settings ~> Backup & reset ~> Factory data reset ~> mark "Erase internal storage" checkbox ~> Reset phone ~> Erase evertything. That the way you can do Factory Reset / Master / Hard Reset on Sony Xperia ZR. If you just need to force restart the Sony Xperia ZR, when you can do in normal way due to the device hang or touchscreen stop responding, you can do: Press and Hold Volume Up and Power button for about 7 seconds.